This week has been plagued by trouble and strife for Prime Minister Theresa May as she has had to put her ministers in their place as Parliament goes in to recess for the summer. It all started with a leak from last week’s cabinet meeting in which Chancellor of the Exchequer, Phillip Hammond allegedly said public sector workers are overpaid. Umm…. Hammond had argued public sector workers are on average better compensated than their private counterparts due to receiving better pensions, and refused to deny reports that he told cabinet colleagues public sector staff are “overpaid”. Hammond’s comment on pay was the subject of one of two leaks from this week’s cabinet meeting, with the other alleging the Chancellor said driving modern trains is so easy “even a woman can do it” – a claim he has strongly denied. When asked if he believes public sector workers are overpaid, the Chancellor said it was a “relative question” but “very generous” public sector pensions put these workers “about 10% ahead” of private sector employees. The comments come amid growing calls to lift the 1% pay cap on public sector pay, with concerns it is preventing the NHS from recruiting and retaining staff. Of course his comments were met with much controversy as in-work poverty has affected many public sector workers (including teachers and NHS staff) have felt the burn of the Tories austerity programme. The chancellor might be a Brexit pragmatist (a Bragmatist?) but his sound economic sense only extends so far. He understands that maintaining links with our largest trading partner is preferable to suicide, and that’s good; but he doesn’t seem to have given any serious thought to what it’s like trying to live through seven years of “pay restraint”, what ramifications it might have for one’s ability to eat, pay rent and enjoy fripperies such as holidays, and raising children. It’s no secret that the issue of Europe (Brexit) is divide the Conservative Party but these leaks could just be the tip of the iceberg. Some Conservative MPs are indecisive about May’s future as their leader and PM, with some looking towards other alternative leaders including Home Secretary Amber Rudd and Jacob Rees-Mogg. However, with the loss of the majority in the recent General Election, surely the Conservatives would want to stand united, now more than ever? All cabinets leak but they mostly do it officially in the form of “guidance” to the media. But cabinet ministers leaking against one another is relatively rare. When it happens, it is almost invariably a sign of deep prime ministerial and cabinet weakness. It demonstrates May’s inability to keep her cabinet in check to respect and adhere to cabinet responsibility* as well as the elephant in the room – ministerial divisions over Brexit. A fragile majority, divisive issues, a weak prime minister and mischief-making ministers always make an unstable mix. Cabinet Collective Responsibility: a constitutional convention in governments using the Westminster System, that members of the cabinet must publicly support all governmental decisions made in cabinet, even if they do not privately agree with them. Some cabinet ministers believe the Chancellor is deliberately trying to ‘frustrate’ Brexit as pro-leave cabinet ministers seek to undermine, if not oust, the man they see as the biggest obstacle in the path of a hard Brexit. Pro-Brexit campaigners such as Michael Gove, Liam Fox and Boris Johnson regard Hammond as an irritant. On the one hand Hammond wants a sane Brexit but on the other hand they want the freedom to drive off the cliff at top speed and to do as such, they need him out of the way. With the chancellor removed, there would be no ‘Spreadsheet Phil’ to moan about the need to prioritise jobs and the economy; they could put slashing immigration first and indulge the ideological fetish that demands the eradication of the European court of justice from every last corner of British national life. Following all the cabinet leaks and public back-biting, Prime Minister Theresa May has warned ministers that their continued bickering and divisiveness could result in Labour rival Jeremy Corbyn winning power. The speech was made at a summer reception for Tory MPs in which she instructed her party to have a break over the parliamentary summer recess and return to Westminster ready for “serious business” with “no backbiting” or “carping”, telling Cabinet ministers to show “strength and unity”. Let’s just hope the public isn’t surprised with yet another impromptu General Election after the summer break! 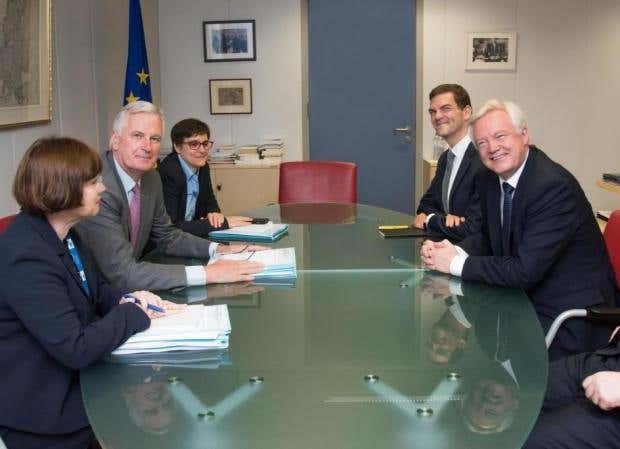 Brexit negotiations continued in Brussels this week and one thing everyone noticed was Brexit Secretary David Davis’ lack of paper work compared to his European counterparts. Well at least he’s demonstrating why we’re leaving, it’s all that bureaucracy! Davis has called on both sides of negotiations on the UK’s departure from the EU to “get down to business” as the second round of formal talks began. The Brexit Secretary has said his priority is to “lift the uncertainty” for EU citizens living in the UK and Britons living in Europe, and the EU has also demanded there must be substantial progress on this issue – as well as on a financial settlement the UK must pay to the bloc and the question of the Irish border – before trade talks can begin. The EU’s chief negotiator Michel Barnier gave an update on the progress of talks in his closing speech, welcoming Britain’s detailed position. He indicated that both sides are now moving in a common direction, although there remains disagreement on points such as how to guarantee these rights, what rights future family members should receive and whether social benefits can be exported. As one would expect, more volatility and areas of compromise are yet to come; Barrier highlighted the first round of talks was about organisation; the second about presentation; the third will be about clarification. The government has announced the increase in the state pension age from 67 to 68 will be brought forward by seven years to 2037, with the changes set to affect everyone born between 6th April 1970 and 5th April 1978. So much for early retirement then. Well at least it doesn’t affect the young(er) generation! Announcing the plans yesterday, Work and Pensions Secretary David Gauke told MPs the rising UK life expectancy means those affected can still expect to receive more over their lifetimes than previous generations, and insisted the government has a “responsibility” to balance pensions funding and being fair on future generations of taxpayers. However, Shadow Pensions Secretary Debbie Abrahams has condemned the change, which would save £74bn by 2045/46, as “anything but fair”, while the charity Age UK has accused the government of “picking the pockets” of millions of people in their 40s. The state pension age for men and women will be equalised at 65 at the end of 2018, before rising to 66 in 2020 and 67 in 2028. Education Secretary Justine Greening has promised an extra £1.3bn in funding for schools in England over the next two years, after complaints from Conservative MPs who believe Theresa May’s failure to deal with concerns about struggling schools cost the government its majority in the General Election. However, the money is being diverted from other parts of the education budget, particularly from free schools and new buildings, rather than coming from extra cash from the Treasury. Robbing from one hand to give to the other, no? The Education Secretary was forced to argue in favour of the extra funding in cabinet meetings after reports of some head teachers begging for extra money, cutting lunch breaks and dropping less popular subjects. In a partial compromise, Greening has also announced a delay in the full implementation of the controversial new national funding formula, which will see some schools receive more money and some lose funding per pupil. Experts from the Commonwealth Fund health think tank have judged the NHS to be the best, safest and most affordable healthcare system of 11 countries ranked, just ahead of Australia and the Netherlands. It is the second time in a row the study, which takes place every three years, has found the UK to have the top health system. Of the 11 nations, the UK put the fourth smallest amount of GDP into healthcare, with just 9.9% invested compared to the 16.6% spent by the US. The news comes despite the NHS suffering the longest budget squeeze in its 69-year history, with the service suffering serious under-staffing problems. Nothing quite beats the NHS eh! Former coalition Business Secretary, Vince Cable has become the oldest leader of a political party since Winston Churchill after being elected unopposed to lead the Liberal Democrats. Cable was the only candidate on the ballot paper when nominations closed at 4pm on Thursday. Other possible contenders, including Jo Swinson and Norman Lamb, ruled themselves out prior to nominations closing, paving the way for the recently elected Twickenham MP to succeed Tim Farron, who resigned after the General Election. ← Leaders of the world unite!